North Star Leather began its history in 1969 in Boston. 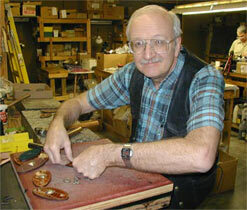 Our founder and Owner Stephen M. Batson discovered the joy of hand crafted leather. From street vending there in Boston, he moved south to a small town called Ruby, SC. Our product line has increased to over 150 products. We do our best to offer quality leather goods at reasonable prices. With 80% of leather goods now-days made overseas, we stand out from the crowd with quality leather goods made here in the USA. North Star Leather's products are guaranteed for as long as you own them. We guarantee all zippers, seams, and hardware. We will pay your postage both ways if the product is defective or needs repair in the first year.Thereafter we request return postage. We do not guarantee wear and tear to the finish: soiling, cuts, scratches etc that happen as you use the item. This is especially true with Rattlesnake skin products; as the skin is much more delicate than cowhide, it can wear more quickly, especially under harsh conditions. If for some reason you have a problem not covered by the above please call 1-800-338-7637.